Cheat sheet cooking guide listing 21 of the most commonly cooked meats, pasta, rice, and vegetables. No need to grab a cookbook or search the internet with this fun pressure cooker accessory. Dress up your Instant Pot, multi-pot, or pressure cooker with this beautiful cooking guide. Our guides are easy to read with simple instructions to help make your dinner a success every time. If you're looking for the perfect gift for a home chef, Mother's Day, or Father's Day this is a must have for programmable pressure cooker and Instant Pot users. This gift is sure to bring smiles and wonderful meals for years to come. We know you'll love this accessory from The Pressure People. Go ahead and cook the farm! QUICK REFERENCE: Cheat sheet guide listing 21 of the most commonly cooked meats, pasta, rice, and vegetables. No need to grab a cookbook or search the internet with this fun pressure cooker accessory. EASY TO READ & USE: Each cooking guide is designed to help you cook dinner quickly. Pressure cooking is all about the steam, knowing how much water and how quickly to release the pressure makes all the difference. CHOOSE THE BEST: Designed and made in the USA by the leader in cookware accessories, The Pressure People. 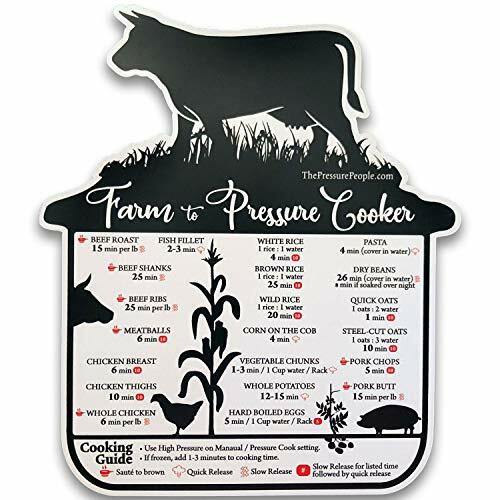 The (Farm to Pressure Cooker) quick reference guide is designed beautifully with precision fit, and constructed with high quality vinyl. This IP accessory is a must have for all Instapot cooks and avid fans. THE PERFECT ACCESSORY: Add some fun and beauty to your kitchen with this quick reference cooking guide. This magnet fits perfectly on your appliance or refrigerator. Size: 6 inches tall by 5.25 inches wide fits any brand programmable pressure cooker, Instant Pot, Wolf Gourmet, Breville, Crockpot, Cuisinart, Black & Decker, COSORI, Mueller, Multi-Pot, or Chefman. BUY NOW: If you or someone you know is an Instant Pot enthusiast, don't wait this is a must have accessory. This addition to your pot is sure to help you bring smiles and a wonderful meals to your home for years to come. If you have any questions about this product by The Pressure People, contact us by completing and submitting the form below. If you are looking for a specif part number, please include it with your message.